We have a variety of products which are ideal for managing water and run-off to offer you a quality drainage solution for a variety of applications including an industrial and agricultural yard or access road to a domestic setting on a drive way. 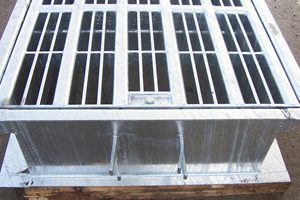 Our drainage grid design is constructed like a small cattle grid and as standard has large gaps between the bars to prevent the grating becoming clogged with debris that can travel with the water. For applications where pedestrians need to walk on the drainage grid, there is an optional pedestrian grating which can be applied. The drainage grid is shorter than a cattle grid and therefore not recommended where stock control is required. If you have stock in the vicinity, please view our cattle grid products page. 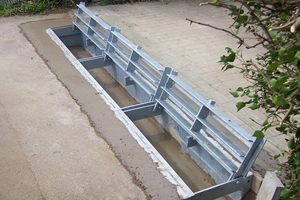 Our cattle grids can also solve your water management and flooding issues too. Our channel drain design is a hinged modular design, constructed to allow units to be bolted together to cover the distance required. These drains are ideal in pedestrian areas where access into the drain to clean out is required without mechanical means. These heavy duty drains are still capable of handling a serious amount of water and a serious amount of traffic too and yet don’t look out of place in a commercial yard area or a domestic drive way setting. 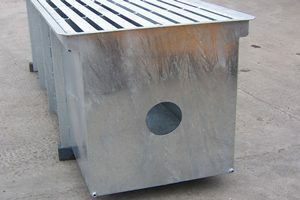 Both our drainage grids and channel drains are perfect to solve medium to heavy water management and flooding issues and depending on the severity of your problem and the site location, will depend on which one is most suitable. They are smaller and therefore more cost effective than our cattle grids and there is a greater flexibility with the sizes if you would like something bespoke. Please contact our experts if you would like to discuss further.